This week's project: making banks. 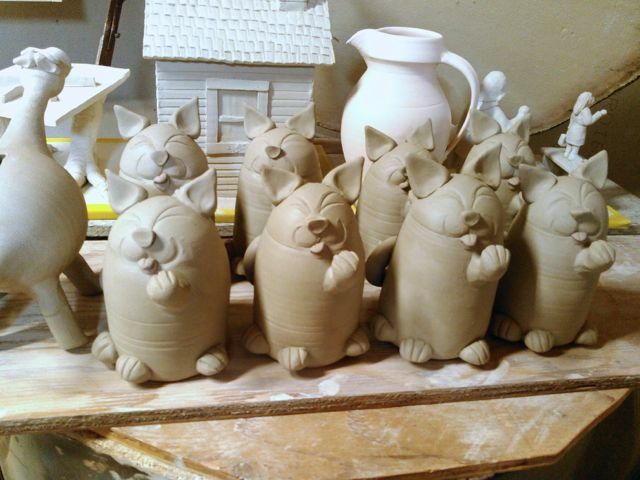 I started doing these at the very beginning of Off Center Ceramics, with pigs, elephants, and cats. Like everything else I do, the varieties burgeoned. Eventually, I found myself doing two dozen different varieties, including dogs, chickens, walrus, whales (blue and killer), rhinoceros, hippopotamus, I shudder to remember what all else. I originally sold them for $20, which even back then was a ridiculously low price; they're a huge amount of work. Now days I charge $40, and only make the best-selling patterns: pig, elephant, cat, hen, frog, and three varieties of dinosaur. And I put off making them until this time of year, because they're still way too much work. This week, I made eight each of pig, cat, brontosaur and stegosaur banks. That's 32 bodies to throw, but also 16 head-and-necks (the dinosaurs start as two separate thrown pieces). I extrude the legs as coil and then shape them: 96 legs. Twenty-four cat paws, plus eight fore-legs and tails. 32 ears, between the cat and the pigs. Twenty-four eyebrows (cat eyes are sketched in with a fingernail, squinted closed). Stegosaurs average 18-20 back plates each, so that's around 160 of those. Porcelain eyes, 48, colored porcelain pupils, also 48. Pink porcelain tongues (for the cats, natch), eight. Plus I have to cut coin slots and punch withdrawal-stopper holes and put everything together and… you see why I try to only do this once or twice a year. 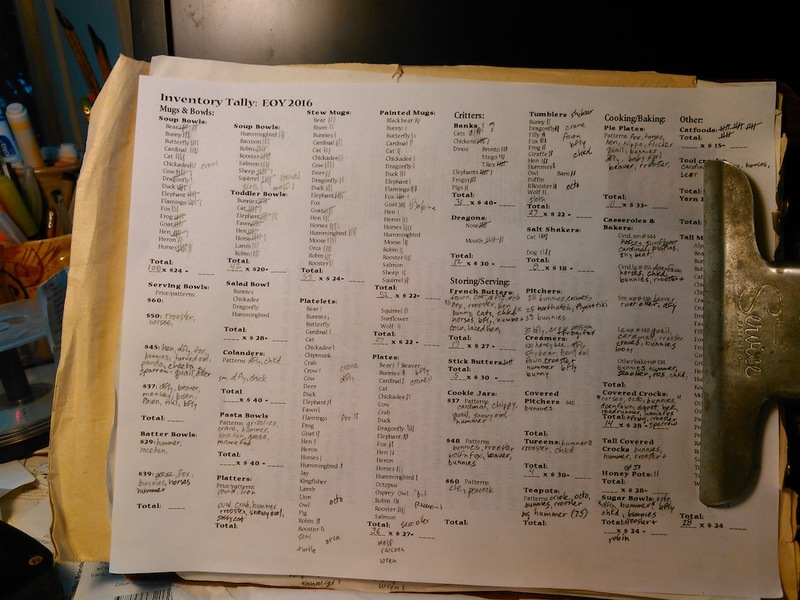 Twenty-four years ago, when I did my first Schedule C for Off Center Ceramics, I had no idea how important the question was: Does this business maintain an inventory? I checked "yes." So every year since, I've had to count the pottery. It's actually a good habit. I've taken to doing inventories several times a year--after big shows, when preparing for a firing. With as many different items and patterns as I have, it's good to have better-than-guesswork on what I have and need to make. We've gotten more organized over time. This year we even kept an inventory, in real time, of what pots we had at Holiday Market, updating as things were sold or replaced from storage. I keep a blank tally form on my computer that we can print off and use every time we need it, checking off standard patterns on bowls and mugs, filling in the less predictable pie plates, bakers, serving bowls and jars. We just did the end-of-year 2017 tally on Tuesday; I shifted and opened boxes, Denise wrote things down. I haven't gone through and totaled up value of the whole works--that'll wait until I start my taxes in late February--but I do have a better idea of where I stand before my first firing of 2017. I have more soup bowls than I expected--108--though within that there are a few patterns I'm almost out of. I also thought I'd sold more toddler bowls, but I still have 42 of them, in a good spread of patterns. Fifty-nine stew mugs, with no fox and only one bunny pattern left. Fifty-two painted mugs, but I'm out of one pattern, down to one each of five more. I made two bags of mugs--50 lbs., 48 mugs--for my next firing, and it won't be any too many. Tableware I'm lowest on are dessert plates and tall mugs, 29 and 28 respectively. I've also got only 29 tumblers, but they're less popular, so I can put off making more of them a bit longer. Baking and serving pots show some surprising holes: only two $50 serving bowls and no $60 server, two small batter bowls, three small square bakers. Large pitchers and covered pitchers are also a little thin, though I'm okay on teapots tureens, and cookie jars. 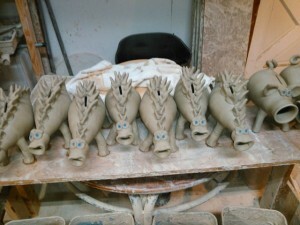 I'm also going to have to make more banks before spring, but that'll wait for my next firing. 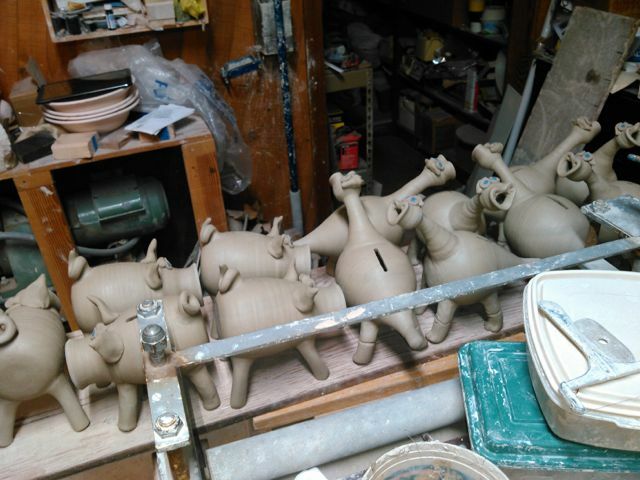 Right now I'm focussing on plugging holes in the pottery inventory, and getting through the full page of special orders for the new year.